A fresh and tasty summer vegetable recipe with crunchy cool cucumbers, ripe juicy tomatoes, creamy avocados and corn. A nutrition-loaded side dish to any meal. Easy corn salad recipes are great summer meals or use as a salsa or condiment. This Fresh Corn Salad recipe from Holly Clegg's Guy’s Guide to Eating Well cookbook is one of our favorite summer easy corn salad recipes. If you only eat corn on the cob and don’t use it in recipes, you are missing out! There’s nothing like fresh corn on the cob to use in recipes. Honestly, there isn’t much to it and really is quick to do. Just get a sharp or serrated knife and scrape the corn off the cob lengthwise or check out my gadgets. 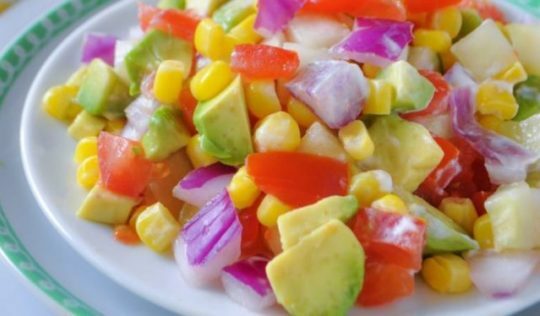 In large bowl, combine corn, cucumber, tomatoes, onion and avocado. In a small bowl, combine lime juice and yogurt. Drizzle over salad. Refrigerate. Serving Suggestion: Pairs perfectly with grilled or baked fish on a warm summer day. Recipe from Holly Clegg’s trim&TERRIFIC® Guy’s Guide To Eating Well. For more healthy recipes, visit her Blog and YouTube channel.